The borough is the largest in Greater London by area and occupies 59 square miles (153 km2). The majority of the borough is Metropolitan Green Belt, including nearly all of the land south of the A232-A21 route between West Wickham and Pratts Bottom. Consequently, it is also perhaps the most rural borough and contains more of the North Downs than any other, as that escarpment is broad between Bromley and Banstead. Most of the population lives in the north and west of the borough, with an outlier at Biggin Hill in the far south. The borough shares borders with the London Boroughs of Lewisham and Greenwich to the North, Bexley to the North East, Southwark and Lambeth to the North West, as well as Croydon to the West. It also borders the Sevenoaks District of Kent to the East and South, and the Tandridge District of Surrey to the South West. 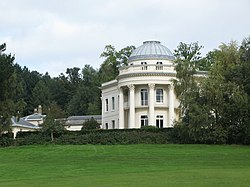 Westerham Heights, the highest point in London at an altitude of 804 feet (245 m), is on the southern boundary. The Prime Meridian passes through Bromley. About 30% of the land in Bromley is farmland, the highest figure of a London Borough. The borough was formed on 1 April 1965 by the London Government Act 1963. It covered the areas of the Municipal Borough of Bromley, the Municipal Borough of Beckenham, Penge Urban District, Orpington Urban District and the Chislehurst part of Chislehurst and Sidcup Urban District. The local government authorities that until then had administered those other areas were similtaneously abolished by the London Government Act on 1 April 1965. In 1969, after a local campaign, local government responsibility for the village of Knockholt was transferred to the neighbouring Sevenoaks Rural District: before 1965, it had been part of the Orpington Urban District. The borough is partly urban and partly rural, the former to the north and very much part of the built-up area of suburban London. The principal parts of the northern section, from west to east, are Beckenham, which includes Eden Park and Elmers End; Bromley with Bickley, Bromley Park and Bromley Common, Park Langley, Plaistow, Shortlands, and Southborough; Chislehurst, with Elmstead and Sundridge. The built-up area around Orpington not only encompasses its direct outskirts of Chelsfield, Crofton, Derry Downs, Goddington, Kevingtown, and Petts Wood; it also includes the erstwhile separate settlements of Farnborough, Green Street Green, Pratts Bottom, St Mary Cray and St Paul's Cray. Other smaller suburban areas include Anerley and nearby Crystal Palace; and Penge. In addition, parts of Mottingham, Sydenham, Swanley and Ruxley lie within the borough boundaries. There are two main built-up areas in the southern part of the borough: Hayes and West Wickham. Biggin Hill, Downe and Keston with Leaves Green and Nash are separate, smaller, rural settlements. Local attractions include Down House (the home of Charles Darwin), Chislehurst Caves, Holwood House (the home of William Pitt the Younger), Crofton Roman Villa, and the site of The Crystal Palace. Bromley was under Conservative control from its creation until the local elections of 7 May 1998 when a Liberal Democrat/Labour coalition assumed power. After a number of by-elections and a defection, the Conservatives regained control on 5 July 2001. The 22 wards are shown on the accompanying map. Ward names often straddle the named settlements and suburban areas above: their boundaries are fixed, whereas the latter are not. In 1801, the civil parishes that form the modern borough had a total population of 8,944. This rose slowly throughout the nineteenth century, as the district became built up; reaching 17,192 in the middle of the century. When the railways arrived, the rate of population growth increased. The population peaked in the 1970s, when industry began to relocate from London. In the 2011 UK Census, the borough had a population of 309,392. All major religions are represented, but of those stating a choice, 60.07% described themselves as Christian. In 2001, of the population, 43.47% were in full-time employment and 11.06% in part-time employment – compared to a London average of 42.64% and 8.62%, respectively. Residents were predominantly owner-occupiers, with 32.53% owning their house outright, and a further 42.73% owning with a mortgage. Only 1.42% were in local authority housing, with a further 12.74% renting from a housing association, or other registered social landlord. A study in 2017 showed that Bromley had the second lowest poverty rate (15%) of any London borough. The following table shows the ethnic group of respondents in the 2001 and 2011 census in Bromley. Bromley is one of only six London Boroughs not to have at least one London Underground station within its boundaries. However, the borough has many railway stations served by London Overground, Thameslink, Southeastern and Southern. The borough also has several stops on the Tramlink network. It was also reported that Boris Johnson plans to introduce either an extension of the Bakerloo Line to Hayes, in Bromley, passing through Beckenham Junction, or an extension of the DLR to Bromley North. One last option is the extension of the London Overground to Bromley North. The most likely is the extension of the Bakerloo Line, but would not be scheduled to begin till 2040, if accepted. In March 2011, the main forms of transport that residents used to travel to work were: driving a car or van, 27.4% of all residents aged 16–74; train, 5.1%; bus, minibus or coach, 5.1%; on foot, 4.3%; work mainly at or from home, 4.0%; underground, metro, light rail, tram, 2.3%; passenger in a car or van, 1.5%. The borough is also home to an extensive libraries service, containing 14 branches, currently operated by Greenwich Leisure Limited under their trademark Better on behalf of Bromley council. The Beckenham Comedy Cabaret, a monthly comedy cabaret event, hosted and run by Jody Kamali, has been running in the heart of Beckenham since 2015, usually on the last Friday evening of the month. London Fire Brigade has four fire stations within the London Borough of Bromley. The borough is the largest in the city: about 150 km2. With just one pumping appliance, Orpington has one of the largest areas to cover in London, measuring 46.7 km2. In 2006/2007, Orpington attended 1,308 incidents. There is also a high volume pump at the station. Beckenham, Bromley and Biggin Hill cover the rest of the borough with four pumping appliances and a hose layer. In 2006/2007 just under 4000 incidents were attended in the borough. Noticeably, compared to 2005/2006 there was an 11% decrease in special service calls (road traffic collisions, chemical incidents, flooding etc.). ^ "Capital Growth: Facts and figures about food growing and farming in and around London". www.capitalgrowth.org. Archived from the original on 30 March 2015. Retrieved 25 April 2018. ^ "Elections 2014 - Local Council Elections - Results 2014". London Borough of Bromley website. London Borough of Bromley. Archived from the original on 3 February 2016. Retrieved 26 January 2016. ^ "London's Poverty Profile". Trust for London. Archived from the original on 9 January 2018. Retrieved 9 January 2018. ^ "Ethnic Group by measures". NOMIS. Archived from the original on 4 March 2016. Retrieved 8 January 2016. ^ Six London boroughs (Bexley, Bromley, Croydon, Kingston, Lewisham and Sutton) are not served by the Underground. The London Borough of Hackney has two stations on its border. ^ "2011 Census: QS701EW Method of travel to work, local authorities in England and Wales". Office for National Statistics. Archived from the original on 15 September 2013. Retrieved 23 November 2013. Percentages are of all residents aged 16-74 including those not in employment. Respondents could only pick one mode, specified as the journey’s longest part by distance. ^ "Libraries". London Borough of Bromley. ^ "Beckenham Comedy Cabaret". Facebook page for Beckenham Comedy Cabaret. ^ a b "London Fire Brigade - Bromley Profile" (PDF). London Fire Brigade. 9 August 2007. Archived from the original (PDF) on 30 May 2008. Retrieved 6 February 2016.